The limestone towers and spires of the Italian Dolomites provide a truly beautiful backdrop for the lattice work of Via Ferrata routes that provide walkers with a good head for heights the chance to experience the sheer exhilaration of a big wall environment. Originally built to aid movement of troops during the First World War, when the front line ran along the crests of many Dolomite peaks; Via Ferratas offer a range of protected scrambling routes using fixed cables, ladders and gorge-spanning bridges which provide a safe means of ascent to high levels normally only accessible by the experienced rock climber. Routes are tailored in accordance with your ability and all we ask is that you come with a smile, have a reasonable level of fitness, sure-footedness and a freedom from vertigo. Once you have learnt the basics of Via Ferrata climbing we will start you out on some easy to moderate levels, before advancing to more difficult routes and longer excursions towards the end of the week specifically geared to the ability of your group. Some routes are short and designed to awaken the Via Ferrata bug inside us all; others are longer with more prolonged approaches which require more substantial effort. The more you put into your Via Ferrata experience the bigger the rewards and the more height you gain the greater satisfaction you'll feel at the top and the more impressive the views. Though this holiday is aimed at beginner/intermediate level we can also provide high grade options for the experienced Via Ferratist with a flexible approach to route choice based on the ability of individual groups. However, if you have never done Via Ferratas before, we'll make sure that we get your adrenalin surging before the end of the week! So why not get out of your comfort zone and come and enjoy a fantastic week climbing some of the best Via Ferrata routes in the region! 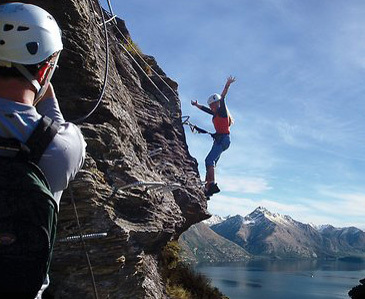 A fun way to experience the thrill of high level mountains and the beauty of the great outdoors. Our Via Ferrata packages are of the best quality and we operate to the highest safety standards using only certified guides with a UIAGM qualification. Our prices, therefore, reflect the quality of our service and should not be confused with other packages offered at the budget end of the market. What is a UIAGM certification? The UIAGM (Unione Internazionale di Asoc DI Guida DI Montagna), IFMGA (International Federation of Mountain Guide Associations) or IVBV (in Germany) is the highest award and recognition for Mountain Guides all around the world. This Association was created in 1965 in Zermatt, Switzerland and its purpose is to designate a standardised level for the recognition, regulation and development of mountain guiding worldwide. This qualification is a legal requirement for all mountain guides operating in France, Italy, Switzerland, Austria and Canada. The Mountain Guides who hold this certification (UIAGM-IFMGA-IVBV) have been through evaluation courses, exams and intense training. They fully dedicate themselves to all aspects of mountain sports: rock and ice climbing, mixed and alpine climbing, glacier travel and rescue, ski mountaineering, off and on piste skiing, radio transmission, topography, avalanche training, First Aid medicine. Fly to Venice Treviso or Marco Polo and onward transfer to your Dolomites Garni (bed and breakfast) accommodation in Zoldo. EASY - Intro to Via Ferrata climbing and use of equipment followed by some easy routes at Cir Piccola e Cir Grande in Passe Gardena. Stay overnight in Rifugio Puez Mountain Hut. EASY/MEDIUM - Mixed Via Ferrata routes at Sasso Piatto in accordance with the ability of the group. Located in Monte Pana. Stay overnight at Rifugio Demetz Mountain Hut. MEDIUM - Choice of two slightly higher level Via Ferratas at either Mesoles in Passo Sella or Tre Cime in Misurina. Stay overnight at either Rifugio Fredrich August or Rifugio Locatelli. EASY/MEDIUM - Mixed Via Ferrata routes at Cristallo in Cortina in accordance with the ability of the group. Stay overnight in Rifugio Lorenzi Mountain Hut. MEDIUM/HARD - More difficult mixed Via Ferrata routes in accordance with the improving ability of the group. The route is the Giovanni Lipella in Passo Falzarego. Stay overnight in Rifugio Guisanni or Rifugio Dibona. HARD/LONG - After having worked up to the more difficult Via Ferrata routes, now try the Alleghesi route in Zoldo and stay overnight in Rifugio Coldai. Alternatively, have a go at a route on Marmolada and a go on a glacier walk in Malga Ciapela. With this option, stay overnight in Rifugio Valleta Maria. Depart after breakfast for transfer to Venice Treviso or Marco Polo and flight home. PLEASE NOTE: This program can change with terrain and weather conditions. This package is based on bookings from Saturday to Saturday with 7 night's accommodation based on 6 people employing 2 UIAGM qualified mountain guides operating on a ratio of 1:3 staff to client. For our minimum group size of 3 the price will be £1299.00 per person. The best flights to take for this package are to either Venice Treviso or Venice Marco Polo. An adult group with a reasonable level of fitness, sure-footedness and a freedom from vertigo. This trip is also suitable for children who are 8 years or older and teenagers will love this brilliant keep fit holiday.